Next review Empire Today Flooring A Rip Off! Just wanted to update you all on the latest with all of this lest you think I had just faded into the sunset. Basically the deal is this, I have to find a certified flooring inspector and pay them out of my pocket to come in and do another inspection. Since I believe the previous inspection was slanted toward Empire because they paid for it and it was a company they obviously do a lot of business with, this is my only option other to get them to replace THEIR bad flooring. I have called several inspectors and they all charge between $200 and $300 not the $60 that Empire said it would be. Another red flag, if that\'s all they paid then they must do volume business with these people to get that kind of price. I have also written to Wells Fargo who financed the flooring, although I have paid the larger amount of this and there is only a small balance left unpaid, I am desperately hoping they will refund me the amount paid. I really believe the best solution is to rip this flooring up and replace it with flooring from a company OTHER than Empire. All I can say folks is please save yourself the heartache and buy from someone else. Rebekah I don\'t know who you are but you really need to stop posting these canned replies that have no basis of truth to them. I have spoken to your customer service and it certainly has never been to you since I have never heard of you other that on these post. In any case it appears I have two threads going on here which I didn\'t realize but the more people know about how bad your flooring is, the better as far as I am concerned. I think you all are a bunch of crooks, you take people\'s money, you install inferior quality flooring and then you say the problem is environmental and you\'ll work with me on the price of replacing the flooring???? Are you insane???? Why would I replace bad flooring with more bad flooring and keep giving you my money? Why would you want to install more flooring that is only going to do the same thing, the environment hasn\'t changed, nothing has changed so the issues I have now would only come back. You get people with your ads, every two minutes there is an Empire ad on TV and you rope people in. I only hope more people find these complaints, I sure wish I had. I wouldn\'t have come anywhere near you guys and I wouldn\'t be faced with having to tear out flooring that is barely six months old. I wouldn\'t be faced with having to spend twice the amount of money. You should be ashamed of your business practices. Buyer beware! Finally got a message today from customer service but still have no resolution to the ongoing issue. Their flooring is very poor quality, they misrepresent the quality be aware if you live in Florida DO NOT buy their laminate flooring. They will tell you that you have too much moisture although they never tell you anything during the sales process nor do they measure you home for moisture. An up front company would come out, check the moisture content and if it is above what their manufacturer allows tell you their flooring was not right for you. Instead they took my money and now that there is a problem I am hearing moisture caused the flooring to expand. Really???? I am so frustrated with this company has anyone had a positive outcome? They come on here and post some BS response that is meant to give you all the impression they are doing something when in fact all they are doing is giving you the run around. If anyone has suggestions please let me know. 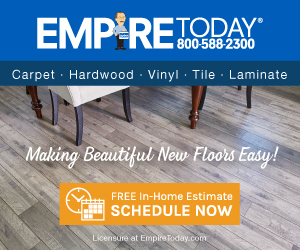 Just an update to this continuing saga with Empire Today and another post to make sure consumers know what they are getting into when buying flooring from these people. After speaking with their customer service supervisor it was decided that they would send an "independent" inspection company out to access the situation. I am not sure I'm convinced how unbiased these people are but figured it was a good place to start. I have just received the report and I can't say I'm shocked to learn that the problem is all environmentally created and not installation related. According to this 'independent' inspector the problem is moisture related. So here is the question I have, if Empire flooring is so sensitive to moisture why was a moisture reading not taken prior to selling and installing their floors. I would think if you sell floors in the state of Florida and know that moisture is an issue you would make sure the environment meets your standards. No such reading was ever taken, salesman never mentioned it either. So now what? Well we will see what BS they feed me next but be warned...if you live in the state of Florida make sure they measure your moisture before installing their flooring. I have floors in the back part of the house for over 10 years never had a problem. Better yet folks look elsewhere and save yourself the hassles I am going through. Home Depot and Lowe's sell good flooring that never give problems, don't buy from Empire. Review #267737 is a subjective opinion of yvon0457.